Scholars disagree about the size and significance of trade linkage for the success and failure of economic sanctions. In order to find out whether trade is important, I organized the 22 empirical studies published in 1985-2017 that deal with the effect of trade on the success of economic sanction by applying the weighted mixed-effect multilevel model and cluster data analysis of meta regression analysis. 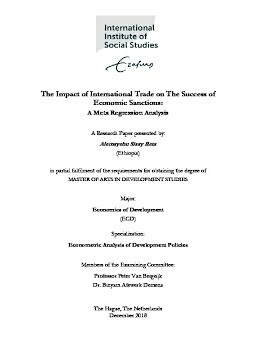 I conducted a quantitative review of the international trade estimates reported on the economic sanction success and estimated the genuine effect size and investigated how the findings which are reported in the primary studies are influ-enced by publication bias, the size of genuine effect and the source of heterogeneity. The meta regression analysis shows that the sample of literature suffers from publication bias and that on average trade linkage has a positive and statistically significant impact on the success of economic sanction with the sample of literature which includes the interaction terms, but it has negatively and statistically significant impact with literature that does not have interaction terms. The genuine effect results of meta significant test, funnel asymmetry and precision effect test and precision effect test considering standard error indicate that the need to investigate the sources of heterogeneity by using multivariate MRA approach. Pub-lication bias, data characteristics and specification characteristics strongly impact on the re-sults of success of economic sanction on the primary studies indicating the need for research-ers to consciously consider in the selection of data, time span and other control variables.